You'll be £25.00 closer to your next £10.00 credit when you purchase In The Ranks OF Death. What's this? When war broke out in 1939 over 20,000 Irishmen were serving in the Royal Navy, Army and Royal Air Force with the greatest proportion in the Army. During the war this rose to over 120,000, suggesting that about 100,000 enlisted during the war. Nine earned the Victoria Cross; three members of the Royal Navy, including a Fleet Air Arm pilot, four soldiers, including a member of the Australian forces, and two RAF pilots. 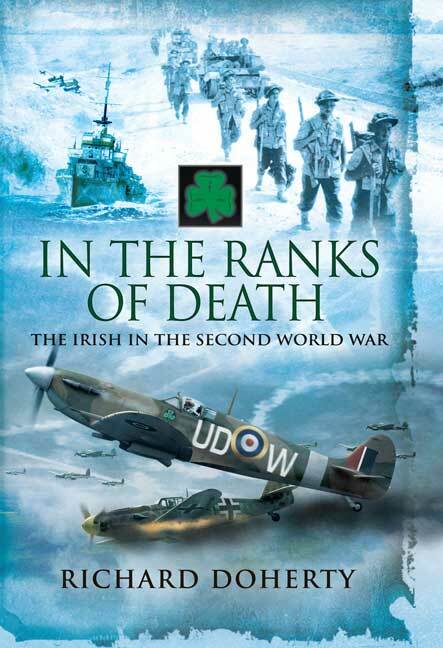 The author looks at the seven Irish regiments in campaigns across the globe, at Irish soldiers across the Army, at Irish sailors from the Battle of the River Plate to the final actions against Japan, and at Irish airmen from the first bombing raids of the war to the closing days of war. Included are outstanding personalities such as the Chavasse brothers, who earned three DSOs, three DSCs and two MiDs, Bala Bredin, Corran Purden, Brendan 'Paddy' Finucane, Blair Mayne and Roy Farran, the latter pair highly-decorated SAS officers. There are also Irish generals, such as Paddy Warren who died while commanding 5th Indian Division in Burma and Frederick Loftus Tottenham, who commanded 81st (West African) Division, not to mention giants such as Alexander, Auchinleck, Montgomery and McCreery. Irish women are not forgotten in the book which also takes a brief look at the Irish in other Allied forces, including a most unusual volunteer for the US Navy whose application to serve had to be approved by President Roosevelt. He was William Patrick Hitler, a nephew of Germany's führer. This is a fantastic book with thorough research complementing an analytical and well scoped approach.